Box-section rim dark grey anodised. CITEC stainless steel DB-spokes black. Patented disc-version front-hub, black powder-coat, with sealed cartridge bearings and AL axle. Patented disc-version rear-hub, black powder-coat, DT/HÜGI 240 AL cassette-body 8/9/10 spd Shimano HG compatible. 24 spokes front 3 cross on disc-brake side, radial on other. 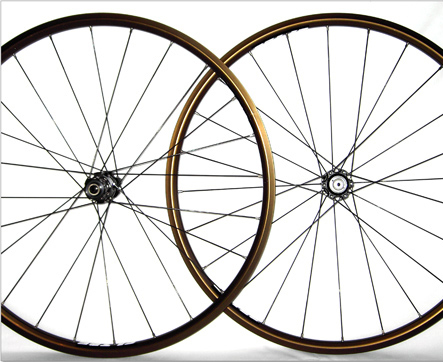 24 spokes rear, 3 cross pattern. Weight ca. 1665 grams. 2004 model, used to sell for £325+.